Yamaha’s entry into the maxi scooter market following the success of the Honda PCX is the NMAX. It was first launched in Malaysia in 2016 and since then has been updated for the year 2018. Changes include new color schemes and Kayaba rear suspension. The TMAX inspired body in the maxi scooter format is still the same. The NMAX is powered by a liquid-cooled, SOHC 4-valve 155cc BLUECORE engine with Variable Valve Actuation and connected to a Continuous Variable Transmission. The engine generates 11.1 kW and 14.4 Nm of torque while managing a mileage of 30 km/L. It carries a very competitive price tag of RM 7918. Have a question on NMAX? NMAX is available in 2 different colors - Blue and Black. The need to stand out from the crowd pushes design in new and exciting directions. Honda introduced the PCX to fulfill that same need with a maxi scooter like design and a larger than normal 150 cc engine. This translated into big numbers for the PCX despite its admittedly high price. Yamaha, chasing those same numbers then launched the NMAX in 2016. It has now received a mid-season upgrade that increases the color options and introduces comfier suspension and more readable instruments in the mix. So, how does it fare against in the market today? Let’s find out. The styling is heavily influenced from the Yamaha TMAX. Anyone finding the top of the front end too wide should realize that is meant to house a gigantic windshield. And then the design will start to make sense. The design is compact and mature. There is no showboating or exaggeration in any of the lines. And yet it will stand out next to any other bike on the road. The design is ergonomic too. The 765 mm seat height makes for an easy riding posture for average height Asians. There is decent ground clearance too at 135 mm. There are 13” wheels shod with 110/70 in tires in the front and 130/70 tires in the rear. The bike has a wheelbase of 1350 mm making it easy to ride through tight traffic. The narrow floorboards will take some getting used to. But otherwise there are many practical features in the scooter. The fuel tank is under the floorboard and can be accessed via the central tunnel. The underseat storage area is big enough to hold a full face helmet and can be accessed with a button near the ignition. The instrument display is a very comprehensive single circular digital display, with black on white text. There is a telescopic suspension in the front and twin shock absorbers at the rear. They are, however, set on a harder setting. It can be adjusted for preload but nothing else. The seats themselves are supportive and do not cause too much discomfort with their width. That makes this scooter best suited for smooth city roads. But no one was going to take it on the highways anyway. The 136 kg weight also makes it well suited for cities. It is a hoot to drive around with its short turning radius. 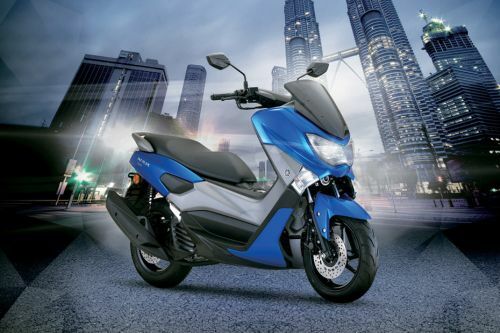 The NMAX is powered by a single cylinder, liquid cooled, SOHC, 4-valve engine. The peak power comes up at 8000 rpm and is rated at 11.1 kW. Peak torque of 14.4 Nm comes at 6000 rpm. This is obviously not a lot but it is still more than its competitor, the PCX. Power delivery is smooth and it is easy to take this scooter to high speeds relatively quickly. This is due to the variable valve actuation that switches the intake cams according to the engine speed. This gives the right amount of power whenever the throttle is twisted, making it easy to fly off from traffic stops. The top speed of around 124 kmph is also within reach. The engine also benefits from Yamaha’s Blue Core technology that apparently allows for high power without compromising on mileage. That mileage figure easily comes out to be 30 kmpl. With a 6.6-litre tank, it can last for 200 km. Braking is relegated to disc brakes both front and rear. These are single 230 mm hydraulic disc brakes that use single piston calipers. They might seem adequate and indeed perform well. But these scooters are supposed to have ABS and right now it is not an option on them. Yamaha says that it is absent in order to keep the price of the scooter low. They have also claimed that they are going to have a variant equipped with ABS on the new model. But right now it has not appeared even on their website. What are the Safety Features Available in Yamaha NMAX? Is Yamaha NMAX available in Electric? HOE HIN & SONS CO.
Yamaha Nmax - What is under the modern looks?